New Zealand makes some of the finest examples of cool climate wines in the world. The industry has boomed the past 20 years ….but things have changed. When we started our winery the industry was dominated by smaller family wineries. Today it is dominated by large industrial wineries. Quality will always suffer when production becomes so large that larger blends are required. We could tell you all about the fantastic grapes we harvest, our stunning record of awards and many other things that any great winery should be able to tell you. I would rather tell you about how we have made our wines very differently, from the beginning, and continue to do so. SAUVIGNON BLANC – Subtle use of Oak for Finesse. Phil grew up in California and loved Sauvignon Blanc made in the Fume Style. He was trained at the University of California so it would have been natural to do things a bit different when he started the New Zealand winery in 1990. Some things he tried worked, some didn’t and some evolved. One that worked was the production of Sauvignon Blanc in a Fume style. He like the powerful acidity and strong fruit flavors of New Zealand Sauvignon Blanc. He didn’t like some of the Marlborough characteristics when they overpower the wines. Green pea and wet hay are fine in the background but not their prominence which is so typical in most Marlborough. The Moutere Hills produces more rounded Sauvignon Blanc flavors with Gooseberry and Tropical fruits dominating the wines. Fume styles are better suited to enjoying with a larger range of foods due to their roundness and structure but are hard to make . Wet hay and green pea do not go well with oak. This is why we use either Moutere Hills grapes or those we can find in Marlborough grown on heavier soils….which are far and few between. We ferment our Sauvignon Blanc, very cool on selected French oak stave’s, in a stainless steel tanks. Cold ferments protect the beautiful fruit flavors and fermentation on oak rounds the wines structure. After a rather long ferment period the wine is left on the stave’s and exposed to lees to develop further. After about 5-6 months of oak aging our Sauvignon Blanc develops some beautiful characteristics that you find in Pouilly Fume or Sancerre wines. Our wines are clearly New Zealand but reminiscent of those old world wines. Most people would not taste the oak flavors due to the perfect balance….but it certainly contributes to its finesse. Different styles are made by the use of different oak, grapes from different areas and the introduction of longer oak aging and partial malolatic fermentation. LATITUDE 41 Sauvignon Blanc Sur Lies – Grapes from Nelson fermented and aged on spicy, vanilla French oak for about 6 months. SPENCER HILL Reserve Fume – Partial malolactic fermentation to add buttery flavors and complexity along with much longer aging on lees and oak. GOOSE BAY Sauvignon Blanc – Flash pasteurization of the juice releases aromatic compounds to add complexity and flavor. Also fermented and aged on oak for about 5 months. CHARDONNAY – Balance, Balance, Balance! There was a time, many years ago ,when Chardonnay was only made by a few wineries. Not all wineries felt they had the proper soil types or climate to produce quality Chardonnay. Then everyone started making it…..all the same way…regardless of fruit differences and winemaker talent. Barrel ferment it, age it for 16 months on partial new oak, malolactic fermentation ….and bang….you have great Chardonnay. And then to make matters worse, due to demand for Chardonnay, new clones of grapes were developed that produced a bigger crop. Chardonnay flavors are one of the most delicate in viticulture. How you deal with fermentation, aging and malolactic fermentation are critical. The use of clones suitable to your vineyard are very important and finally….not every vineyard is suitable for growing Chardonnay. It requires some heavier, mineral soils for character. Not every clone of Chardonnay produces great Chardonnay. We prefer clone 15 or Mendoza clones in New Zealand. We make ours in a number of styles. But the one thing that stands out is balance. Without balance Chardonnay is nothing. One must be able to taste the subtle fruit, oak, and influences from lees contact and malolactic fermentation….but only when it is in so much balance that none overpower the other. We strive for this every year and in some years it is absolute perfection….but in all years it is always in balance. Our Chardonnay’s have had many accolades over the years. LATITUDE 41 – Grapes from Nelson fermented and aged on spicy, vanilla American and French oak for about 12 months. Full malolactic fermentation with high di-acetyl bacteria. SPENCER HILL Coastal Ridge – Fermentation and aging on French oak for up to 12 months. Full malolactic fermentation with High di-acetyl strains of bacteria to give creaminess and butter and a full on Chardonnay style. SPENCER HILL Tres Elegant – Fermentation and aging on French oak for up to 12 months. Partial malolactic fermentation with Low di-acetyl strains of bacteria to give more flintiness and elegance. SPENCER HILL The Wild One – Fermentation with natural wild yeast and aging on French oak for up to 12 months. Full malolactic fermentation with medium di-acetyl strains of bacteria to give some creaminess and butter along with a bit of funkiness from the wild yeast strains. GOOSE BAY – Flash pasteurization of the juice releases aromatic compounds to add complexity and flavor. Also fermented and aged on oak for about 9 months. Partial to full malolactic fermentation with medium di-acetyl strains of bacteria. PINOT GRIS – Perfect for New Zealand….on Heavier Soils. We were one of the first to plant Pinot Gris in New Zealand. We selected it when Phil was a member of the national Vine Improvement Group and he saw it’s potential on the heavier soils of the Moutere Hills. There in lies the key. It is a very delicately flavored grape and does not give the required flavor profile on lighter soils. It has been planted throughout New Zealand and the best examples are wines made from grapes grown on heavier soils. It is very important to pick it at the right time otherwise your wines end up being a sugary water concoction. Our technique of cold fermentation in stainless steel tanks, on spicy French oak stave s, also adds to its complexity and provides extra length. The trick is to not allow the wine to pick up much oak flavor nor to allow malolactic fermentation to take place. New Zealand has some of the world’s finest examples of Pinot Gris (Grigio) and we believe ours are one of them. LATITUDE 41 – Grapes from Nelson fermented and aged on spicy French oak for about 5 months. GOOSE BAY – Flash pasteurization of the juice releases aromatic compounds to add complexity and flavor. Also fermented and aged on oak for about 5 months. PINOT NOIR – Understanding a Difficult Wine. Here is a wine that promises so much and consistently under delivers. Part of the reason is that every winery believes they can make this wine if they can grow it in their vineyard. Pinot is another very delicate flavored wine, similar and related to Pinot Gris. It requires warm (not hot) and cool nights with a long growing season. If it is grown on light soils it will be lacking in length and structure. In the Moutere Hills, Pinot Noir grown non-irrigated mineral soils is perfect for this grape. Another important step in making a well rounded Pinot Noir to use different clones and blend. We grow a number of old and new clones on ten different sites. We make our Pinot Noir quite differently than most winemakers. We ferment in one ton ferment bags that are fully enclosed. The grapes are crushed into the bag and a tube within a tube is placed part way into the bag. The outside tube allows gas to escape and the inside tube allows the wine to flow upwards and over the skins. This allows for very gentle extraction without plunging. The bags heat up during fermentation to about 34C resulting in soft tannin extraction with amazing color. Once ferment is complete the wine in the bag is removed and the skins placed into the press for a gentle pressing. We always combine the free run and pressings. Because the ferments are done in one tonne batches we have the opportunity to look at each batch, choose the best and work out the best blends….always saving the best for our Reserve wine. LATITUDE 41 Small Batch Pinot Noir – Grapes from Nelson’s Moutere hills. fermented and aged on spicy, vanilla French oak for about 12 – 14 months. Full malolactic fermentation with high di-acetyl bacteria. Small batch fermentation in one ton lots. SPENCER HILL Coastal Ridge – Fermentation and aging on French oak for up to 16 months. Full malolactic fermentation. The best of the small batch ferments. 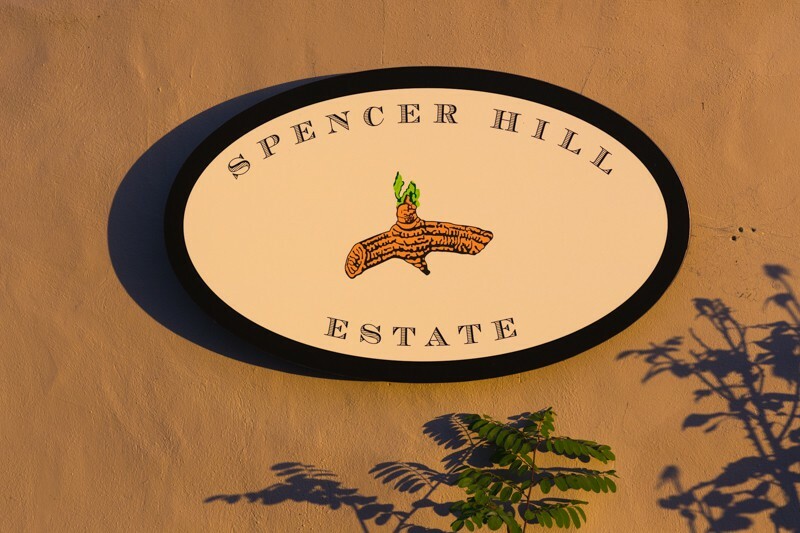 SPENCER HILL The Wild One – Fermentation and aging on French oak for up to 16 months. Full malolactic fermentation. Fermented with natural wild yeasts to give it an interesting character. GOOSE BAY – A stunning example of Kosher Pinot Noir that has developed a reputation within the Jewish communities worldwide. Fermented and aged on oak for about 12 months. Full malolactic fermentation and made in separate small batch ferments.